FANTASTIC! I have made these MANY times now, and they are always well-received. I do make some recommended changes: butter instead of margarine, 3 1/3 cups flour and sub 1 cup white sugar and 1 cup powdered sugar for the 1 1/2 cups white sugar called for. I also use powdered sugar - as opposed to flour - when rolling them out. These are easy to handle, and hold up FABULOUSLY . . . tasting great even a week later! 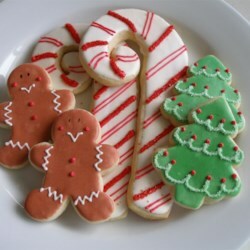 I use the Sugar Cookie Icing on this site, and they always look amazing. A side note: the first time I made these I made a batch of this recipe AND a batch of the Best Rolled Sugar Cookies, and these were by FAR better - both in texture and taste.